The Super 40 5X10-inch case design, modeled after our Top Ten race mufflers, gives you a deeper tone that retains our famous 40 Series sound and feel. 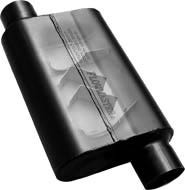 Our Super 40 is the most agressive, deepest sounding street 2-chamber muffler. The classic black case maintains that original Flowmaster look.